It is the year 2019 and a glance at the Do$ch website, http://www.dosch-uk.com, will show you that Do$ch was born in 1999. so a double decade of Do$ch is upon us. The crowd in the Lion is not exactly enormous, which means more room for us. ‘I Can Tell’ gets proceedings off to a great start and is quickly followed by a sizeable chunk of prime Dr Feelgood fillets (Wilko era). Wilko’s solo classic ‘Dr Dupree’ is in the mix too as is The Pirates’ ‘Please Don’t Touch’. Their own compositions would slot in nicely on any Feelgoods lp though and they finish their first set with Screaming Lord Sutch’s wonderful ‘Jack the Ripper’. Fag time for Ian and Andy, then Ian straps on his open-tuned Gibson for their own ‘Bonneville Blues’ and ‘Back in the Night’. Sadly. the last bus home was imminent but not before their tremendous version of ‘Werewolves of London’ had brought a smile to the faces of us all. So in an era when ‘music’ seems to be something performed by talent show hopefuls to fill Simon Cowell’s hipster trouser pockets, it is a privilege to actually see real musicians plying their excellent trade. Andy and Ian (with a range of rhythm sectioners) have been coming up and down the M1 for 20 years. For the money? Hardly…they just love the job and the music. 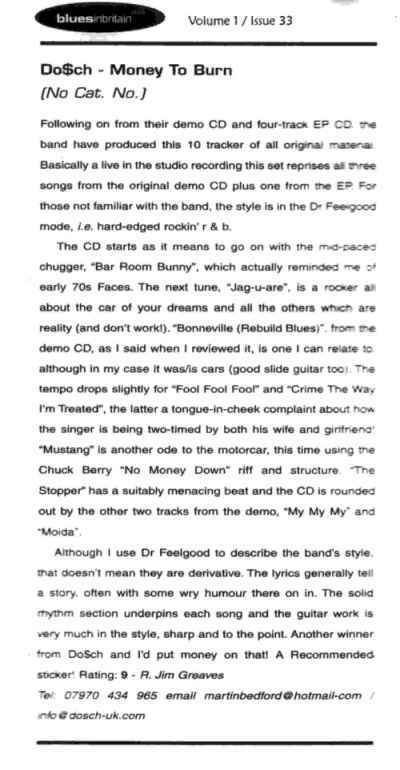 We have been Dr Feelgood fans since the Wilko days and it occurs to me that if either Do$ch or the current line-up of Dr Feelgood (who also started in 1999) were to play the complete live ‘Stupidity’ lp, both of us would probably plump for Do$ch. What more can I say? Sunday gig, which is great for us as we don’t have to bale out at half-time for the last bus home. So, no messing, Mr Bartram starts up with his great, off-the-wall guitar intro, which made me think of their fellow Sheffield person, Monty Python’s Michael Palin being here and saying ‘NO ONE expects…Route 66′. A cracking start, and if anyone there had a 40 year-old Dr Feelgood set-list, much of what followed would be more than familiar. ‘Hog for you baby’, ‘All through the city’, ‘Roxette’, ‘I can tell’, ‘Going back home’, ‘Back in the night’ and ‘She does it right’ were all blasted out, with Mr Bartram dashing around the room wielding his Telecaster. Fans of the MK 2 Feelgood line-up weren’t left out either, via ‘Down at the Doctors’ and ‘Milk and Alcohol’, and we also get Wilko’s ‘Dr Dupree’. They are far from just a Feelgood tribute act though, and they throw in some of their own distinctive songs about… a Jaguar, rebuilding motorcycles, Jack the Ripper, working down the pit (complete with audience headlamps), the loss of smoking rights, the women in their lives and being seventeen. Classics such as ‘Slow Down’, ‘Werewolves of London’, ‘Please don’t touch’ and ‘Walking the dog’ are all do$ched up for us too and although there was a football match on in South America, the artistry here on view made it a minor intrusion. We’ve seen Do$ch many times in the past decade, with differing rhythm sections, and they have never failed to deliver the goods. We both reckoned that this time they even surpassed their usual peerless performance. Her Ladyship managed to remain seated for most of the night, but ‘Back in the night’ proved too much for her ambience! Come back again soon Andrew, please. ----- A sub section of the rocking blues category holds the fantastic Sheffield rhythm and bluesers Do$ch, and this band really came of age in 2007 with support slots with Dr Feelgood and The Sensational Alex Harvey Band and headlined Friday of the Yorkshire Rock and Bike Show, and blew us all away at RotNstock in June, gaining fans all the way. DO$CH were up next and again, they were fantastic, it's the second time I've seen them and it certainly won't be the last, You're Just Tall and Bonneville Rebuild Blues were two of my favourites, but the whole set was filled with amusing blues, (can you believe that, amusing blues!!) dynamite! Wilko and the boys put on what I thought was one of their best performances at the Pot last Friday. Always deliver a powerful and thoroughly entertaining set. Bonus on the night was the fact that the band on before them - DOSCH - were equally excellent. Dr Feelgoodesque in their delivery, they captivated a packed Flowerpot crowd. Expect to see a lot more of this excellent band. If you’d paid to see em they’d be great value for money – three sets rather than the usual two and, in the style of Wilko or the The Feelgoods, Do$ch just get stuck in! The first time we saw Do$ch we thought they looked pretentious, what with the top hat and long coats, but as soon as Ian began to play his bespoke doschcaster in front of the rock solid raw edged rhythm section of ex Prowler bassist Richard Makinson and drummer Phil Gilbert then those thoughts were banished. Andrew too– top hat and all – has a larger than life stage presence and clearly enjoys entertaining the appreciative public, even though he claims in all honesty to be "just messing about"!! The three sets, with their own "story" songs (available on CD –Money To Burn) interspersed with a few made famous by the aforesaid Canvey Islanders and Mick Green and co, went all too quickly. This band enjoy performing and those fortunate enough to be in the audience enjoy it too. Ian Bartrum is clearly a natural guitar genius with a bigger rack of guitars than Hamster Slim, all put to good use! We're a bit worried about the ever present Mr Do$schtray, what will become of him when the baccy ban comes in??? (Moon and Sixpence - Glossop) What can we say? The last time these guys played they blew us away. Maximum RnB indeed. (Mal of the Lion, Castleford) Just like to say Dosch are one of the best bands to have appeared at The Lion in 20 years and I would recommend them to anyone and look forward to their next gig at The Lion! They are fantastic. Saw Dosch at the Lion in Castleford on Sunday night, what a fantastic band we thought you were. We enjoyed your music and you kept us captivated all the way through. Hope it wont be long before you play round this area again, until then we bought your album so we'll be listening to that! The New Roscoe in Bristol Street (off Roseville Road) is about a mile north east of Leeds City Centre and as well as being a popular pub with the Irish community it is also the premier music pub in Leeds, with live music on most nights of the week. Music featured includes blues, rock, Irish, folk and country and western. I have seen Sheffield based Do$ch several times in the last four years, at the Burnley and Colne blues festivals, and also in Leeds. The band describe themselves as Maximum Rhythm and Blues. They play a mixture of blues and rock including a lot of their own material. The band is fronted by Andy Hinkler who looks a bit like the late David Edward Sutch (Screaming Lord Sutch) with his black tuxedo jacket and top hat. They also comprise of guitarist lan Bartram, bass player Richard Makinson and drummer Pawel Marcinkewicz. They started with one of their own songs, "I Get The Blame", followed by a brilliant version of "Route 66". Then came one from their C.D. Money To Burn, entitled "Jaguar", in which Andy, like on a few other songs, comes out into the audience and picks on someone to sing a verse to before moving on to someone else. He has a great rapport with his audience, as does guitar player lan who also occasionally comes into the audience to play his excellent guitar licks. My favorite song from their C.D. is "It's a Crime the Way I'm Treated". This slow blues is always well received by the audience. They also played "Bar Room Bunny", "My My My" and "Motor Cycle Rebuild Blues" from the CD, along with other blues and rock songs. I had to leave shortly before the end to catch my bus home but not before they played a great version of Dr. Feelgood's "She Does It Right", which is one of my favorite songs of the Wilko Johnson era. This led into a performance by Do$ch and their lively real rhythm and blues style rocking which has seen them rapidly climb the ranks of the R&B scene in the UK over the last 12 months. Commencing with a favourite of mine, Bonneville Rebuild Blues, I realised I was singing the words...I have rebuilt a Bonneville as it happens! Great song though! Do$ch are great showmen and made a number of new fans with a proper show and original material in the rhythm and blues style. A tight rhythm section, and superb guitar work from Ian Bartrum provided a roving Andy Hinkler to wallow in a brilliant groove delivering great vocals and lyrics. One very special moment was when Andy came out to the audience picking out Vikki of Angel of Sin who responded perfectly to Andy's lyrics, what a brilliant show of professionalism from Do$ch and Vikki, everyone loved it! How could they not? This is a really good CD from Sheffield based rhythm rockers Dosch. Featuring the talents of Andy Hinkler, vocals, Ian Bartram, guitar, John E Cash, bass, and the highly rhythmic Dave Bickley on percussion. The CD was recorded live with only vocal overdubs. The CD blasts off with Bar Room Bunny, an original song, as are all of these on the CD. The style is rocking rhythm and blues, perhaps with a slight Doctor Feelgood flavour. It sets the pace for the rest of the CD and it’s great to hear this style for a change. “I need a Jag-U-Are” sings Andy Hinkler and this 12 bar canters quickly on with amusing angst about buying a Caddy, a Chevy and a Ford, but he really wants a Jag-U-Are! It’s full of great rhythm and lyrics and some extremely nice rock and roll guitar from Mr Ian Bartrum. The first song I ever heard from Dosch, is the next one on the CD which is Bonneville Rebuild Blues. It really struck a chord with me having rebuilt a Bonneville in my youth! The track starts off with a soundbite of a genuine Triumph Bonneville revving up as Ian Bartrum comes in with some minor key tinkling on his guitar. Boom and the drums are in and Andy’s vocals tell the tale of the rebuild blues! “The engine’s on the table, the frame is in the room, I gotta get it together real soon”….fantastic, it reminds me of my long suffering mother’s kitchen table and her oil-soaked son, (now a gin-soaked journo!)! It’s a great song and Ian Bartrum’s slide guitar is definitely in the George Thorogood school. Fool Fool Fool starts with the menacing bass line which invites Andy’s vocals and the beautifully toned guitar riffs of Ian Bartrum. Dosch songs always tell a great story and this one is about being a fool for a lady, but this lady is then told she’s missed her time! Another song about being mistreated by those foxy ladies is Crime the Way I’m Treated.This is another song with a story line, a great bass and drum progression, and Ian Bartrum’s perpetually superb guitar work. This takes us into My Baby, She’s Rich, a well put together song, well-told and well-phrased by Andy Hinkler. It works well with the constant bass and drum rhythm and the melodic invention of Ian Bartrum’s guitar. Mustang is another song I could relate to. The story of lusting after a 1967 Ford Mustang takes on a riff from Gary Moore/Jimmy Rodgers "Walking By Myself" and with the cymbals tinkling after the riff. The song, like the car, drives nicely and with another impressive mid-song guitar break, allowing Andy to continue with the amusing lyrics which include as the chorus, “When I get my Mustang, I’ll be in motor car heaven!” Good stuff! The song entitled The Stopper commences with a John Mayall “Oh Pretty Woman” riff and the growling and menacing vocals of Andy Hinkler, who by the way is the brother of The Mission’s Simon Hinkler. It’s a strange song lyrically and has a slight Tom Waits feel about it. The riff carries it through and the strange lyric “Don’t say no to the man when he’s standing with a stopper in his hand” had me slightly puzzled. It’s a good song though! The track which follows is a great rock and roller. Entitled My My My, it’s a 12 bar with a rocky feel to it which must guarantee dancers on the floor and contains a nice guitar break in the Chuck Berry/Keith Richards style. This is a very enjoyable and lively CD in the old fashioned rock and roll, rhythm and blues style. The band is packed with talent and they have managed to bring a live and exciting feel to the recording. We recommend you play it with the volume on the high side, it’s great. As a footnote, I asked a colleague in Mexborough if he had seen Dosch at The New Masons venue, and he said he had and they were probably the most enjoyable band that had performed there! Praise indeed! A cold, wet, Sunday night in Sheffield should not bode well for any gig, even if it is at one of the city's finest venues. However when Dosch take to the Boardwalk's stage you'd be forgiven for thinking that they were about to play to a full stadium. From the opening bars of 'I can tell' you know that this is a band that has its 'mojo' well and truly working. Daren Dodds rocks on his heels, pounding out bass riffs to match Richie 'Rich' Walker's powerhouse drumming. A dynamite rhythm section like this is hard to find, but coupled with the double act fronting them, the effect is electric. 'Mr' Ian Bartram on guitar, chops out chords as sparse and effective as a 'Keef' or Wilco. Whether staggering around the stage like a demented zombie, or leaping 'a la' Townsend in the air, he keeps a tight rein on his guitar, never having to resort to interminable guitar solos to impress - although you just know he could. Then there is frontman vocalist, Andy Hinkler. Part raconteur, part side-show barker, he possesses the same , almost vaudevillian, presentation of the late Alex Harvey. Whether belting out the rocker 'Bonneville Re-build Blues', or 'breaking down' in the soulful 'I'll still be around', he maintains the bands self-deprecating humour without ever becoming a parody - and maybe that's one of the bands real strengths. Although these guys truly rock, there's no pretention - their mission is to have a GOOD TIME - and in spades. Their final number 'Moida' is a classic waiting to be discovered. Bartram careers through the lead, with a nod to every classic guitar riff in the books while 'machine gunning' the audience, and Dodds and Walker seem set to run you over. But it's Hinkler who maintains control, dramatising the tale of a man 'who dun his woman wrong' and is begging for the death penalty. I reviewed this band’s demo a couple of months ago and this is their follow up CD EP. There is a bit more info with this release so I can confirm that they are a four piece unit consisting of Andy Hinkler vcls/hca; Ian Bartram, gtr; Ade Carver, Bass; Dave Bickley, dms. As I said previously they play Dr. Feelgood style R’n’B and here all the tracks except the opener are originals. We’re definitely in Feelgood territory with ‘I can tell’ with good riffing and break by the guitar. I really liked the next track ‘The Stopper’ which has a nasty menacing guitar line. ‘Slow Thing’ is exactly what it says! A quiet guitar intro leads into a louder ‘bomp-de-bomp part with harp and guitar solos. ‘Dosch Song’ is a song about, well, go on, you make a wild arsed guess! Good lyrics here. ‘Kafleen’ is a straight rocker to end with. The originals stand up well and are in style. No need to change my original (re)view, this is energetic, no frills Feelgood style R’n’B and keeps up the standard of the demo CD. No doubt a good band to catch live. The Classic Rock Bar used to be the Jolly Buffer but we suspect there was no buffing going on. The new name serves the function of telling you exactly what the pub stands for. The only thing missing is the word ‘beer’ (and moonshine is definitely beer). Nothing much has changed since it was Sheffield's premier R’n’B, Rock and Blues bar back in the Nineties. It’s still an unlikely venue, with the band squashed between two rows of pillars, and the audience either crammed into the bit of space in front of the band or peering between the pillars. Not surprisingly it makes for a sweaty, in your face experience, just like all the best rock shows. The band was DO$CH, the nearest you’ll come to prime-time Dr Feelgood in Sheffield. Singer Andrew Hinkler, top hatted, has a barking, cajoling voice and not a little humour in his delivery. He’s flanked by guitarist Ian Bartram, dressed in a ridiculous bright red dress coat. His guitar playing however is sublime and always on the button. The band has moved up a notch or two since the arrival of the new rhythm section. The set is made up of Classic R’n’B such as route 66, and their own material which shows an obsession with motorbikes, money and women. Nothing new here then, but their own songs fit in seamlessly with the classics. But most of all they are just good fun. DOSCH – IN IT FOR THE …. There's a good opener (whether CD or gig) in ‘My My My’, a Ch uck Berry style rocker. The next song is one I can really relate to, ‘Bonneville (Rebuild Blues)’, although with me it’s been cars rather than bikes. A good ch ugging rhythm, and slashing slide guitar, yes I definitely liked this one. The third track ‘Moida’ is very much in the Feelgood style, particularly the chopped out guitar riffs. Rock solid rhythm section, growling vocals and aggressive guitar all topped off with bags of energy, I recon they must be a good live act. If you’re into the Feelgood genre then this is for you. A very promising demo. 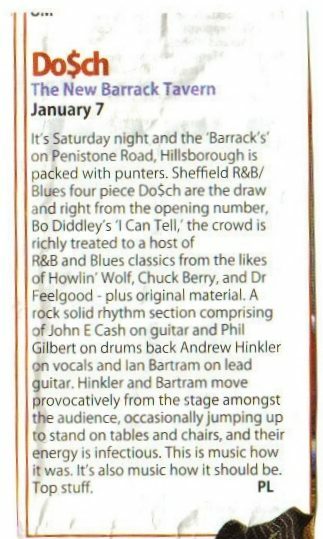 Sheffield rhythm and bluesers Do$ch did three sets in The Lion in Castleford to quite a healthy audience on Sunday night. The pub was quite packed as the band did their own brand of rock, which is very entertaining original material with an emphasis on comical and sometimes serious lyrics from the pen of vocalist Andy Hinkler. Co-writer Ian Bartrum, the bands excellent guitar player is a great partner to Andy as their CD Money To Burn is a testament to. With Richard Makinson on bass and Phil Gilbert on drums, the band as a whole are a tight unit that play music everybody seems to enjoy, and they really do enjoy! The band , it was commented upon, also enjoy playing to the audience and this saw Andy and Ian out and about in the crowd and everybody loved it. The band were being watched by members of other bands including Lenny of the Spunksters, John of Highway 49, Pete of Black Rising, Ian, H and Jon of Riff Raff, and Daz of Gypsy, and all these lads gave the thumbs up to Dosch. If the band were worried about a rebooking, they have no worries because landlady Julie was raving about how good they were ! Everybody enjoyed it, partly because it was different to the norm but mainly because it was so well delivered. Roll on the next time! With a very good turn out of the biking fraternity in attendance the evening is set for a bit of a rare occurrence, there's a band on I've never seen before. Dosch hail from Sheffield and have brought with them some Yorkshire sunshine (no not rain). With a definite rhythm and blues style these guys have obviously come to entertain. The front man Andy Hinkler, resplendent in a screaming Lord Sutchesque top hat possesses classic blues vocal chords. Meanwhile on guitar is the talented Mr. Ian Bartram with many changes of his axe, he marches around the stage and around the floor mingling with the audience as if he owns the place. He plays a mean slide guitar too. Dosch don't do many covers the majority of their set are original numbers, with songs like "the stopper", "jaguar" and the amusing "Bonneville" these Yorkshire lads bring a much needed rye sense of humour to what can be a bit of a serious style of music. Leaving the crowd wanting more (always the best way) Dosch have definitely made a few new friend down at the old MFN. From the very first drumbeat and chord, you knew you were going to enjoy this band - because of the style and quality of the Dr Feelgood influenced music and the fact that the band members enjoy it too. If you haven't seen Do$ch before then you're in for a treat. They usually start a tad earlier than most of today's performers and manage to squeeze in three sets....with very short breaks in between - excellent! The music is mainly self penned - crisp, blusey numbers that tell of a miss spent youth, with motor bikes, ladies and members of the legal profession featuring heavily. Do$ch also feature a few classic tracks from the likes of Rufus Thomas and Sonny Boy Williamson as well as one or two of Wilko's. Oh! and Do$ch do do sentiment - with just the one tear jerker - boo hoo! If you enjoy the edgy (nothing to do with U2) sound of a great crunchy guitar in front of a pacey but well disciplined rhythm section, some well delivered and amusing lyrics performed by an unassuming but talented quartet...then don't miss the next Do$ch gig - you WILL enjoy it! Dosch are a fun four-piece RnB band, incorporating rock and roll and blues into their sound. A popular on the blues festival circuit, their up-beat sound incorporates the sounds of Chuck Berry or Johnny Winter, all played with the musical competence that fans of the blues have come to expect. Andy Hinkler's old school blues rasping voice lends itself well to the sound, with the rock and roll ‘Jag-u-are’, and ‘Bonneville’ giving a nod to the rock and roll biker sound of the 50s and 60s. ‘Fool, fool, fool’ is a more thoughtful track, echoing some of the styles of Fleetwood Mac and Peter Green, while ‘Mustang’ continues on the motoring theme, again with a classic blues sound. ‘Crime The Way I’m Treated’, adds some humour to the album, with it's tale of complaint on being two timed, by not only his wife, but his girlfriend too. For anyone wanting an introduction to blues-rock and RnB, this album should prove interesting. It’s well played and enjoyable. A formidable night of blues / rock awaited the fast growing crowd tonight, but as an unexpected appetiser we get the bluesy / folk of Will Tang. A short set of good vocals, acoustic guitar and a mean harp unfortunately struggle to grab the crowds attention as they wait restlessly for the first of the advertised bands in the form of local rock band DO$CH. The roar from their followers lifts the atmosphere and the zany front mans undertaker hat, complete with ribbon, catches the eye before they let rip with new track ' Standing In The Cold Again'. Reminiscent of the Alex Harvey Band their bluesy lead guitar is top quality and despite some sound problems they deliverd an impressive set of mainly original material lapped up by their supporters.